Barkby United guaranteed another season in the County League top flight with victory in their basement battle against Uppingham on Saturday. 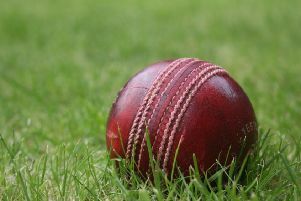 An eight-wicket stand of 61 helped them to a tense three-wicket away win which lifted them to ninth in the Premier Division, 57 points clear of second-bottom Uppingham with one match to play. Uppingham won the toss and decided to bat, but their innings started badly when Johnson clean-bowled Ben Farnsworth without a run on the board. Jamie Dunford and Nick Green put on 63 for the second wicket before Morris came into the attack and bowled Dunford for 41. Uppingham lost three further wickets while only adding eight runs, as Morris, bowling at a lively pace, took two wickets in an over. The home side lost their sixth wicket when Dave Botting had Richardson caught by Morris before spinners Sharp and Botting slowed the scoring rate down. Louis Botting had Cox trapped LBW for 25, and Morris (5 for 29) returned to the attack to claim the last two wickets and bowl out Uppingham for 148. Barkby’s innings also started badly when Boyce was caught in the slips by Farnsworth for six, and two runs later Funnell was caught for two. The visitors looked in trouble when they lost the wickets of Wood (6), Flowers (7) and then Tew, caught in the slips by Farnsworth for 21, to slide to 46-5. Barkby then lost the wickets of Silver, LBW for 10, and Morris, run out for four, but Louis Botting (51 not out) and Cameron Sharp (27 not out) added an unbroken 61 to take Barkby to a vital victory in the 49th over. Barkby host relegated Uppingham in their final match of the season on Saturday, with an 11.30am start. Bowling: L. Botting 10-2-46-1; J. Johnson 9-2-30-2; A. Morris 9.1-2-29-5; C. Sharp 10-3-27-1; D. Botting 8-4-15-1. Barkby: M. Boyce 6, J. Wood 6, H. Funnell 2, D. Tew 21, S. Flowers 7, B. Silver 10, L. Botting 51*, A. Morris 4, C. Sharp 27*, Extras 16. Total: 150-7.